Mark McKenzie talks about his first year with the Union. Happy 30th birthday to CJ Sapong. 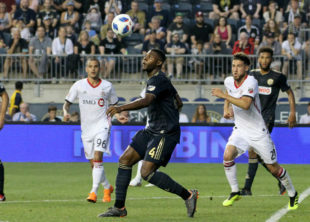 Watch the scientific breakdown of Cory Burke beating Minnesota United’s defender to kick off their five goals that match. See the Union’s new field for the new year. MLS’ top ten player revelations of 2018 have been released and it includes Trusty and McKenzie. The top ten personnel moves in the MLS in the 2018 season, including the Union acquiring Borek Dockal. Here’s Top Drawer Soccer’s 2019 mock draft, where they predict the Union draft Kentucky’s star striker, JJ Williams. All-time winning-est head coach in MLS history, Sigi Schmid passed away on December 25 at age 65. The USL’s top ten goals of the season. The Premier League’s Best XI is out and it’s highlighting the best players of the season so far (i.e. Liverpool and Man City players). Danish soccer player Nicki Bille survived a murder attempt after being shot (by a shotgun!) in his Copenhagen home on Christmas Day. Afghanistan’s women’s players allege sexual and physical abuse against Keramuudin Karim, the Afghan FA president. What to look out for in the Premier League this weekend. the only thing more worthless than a mock draft is the draft itself. It’s content man. You need content in the off season. What are you going to write about for the next few weeks? Agreed. Thank you Sara, Ryan, Jim, John, Dan, Peter and rest of PSP. PSP is on holiday break, much like MLS, so content will be light until January 7. And it’s a well deserved break. But who is going to write about he mock draft. Rumors of Messi in talks with the Union and all the other off season crap. JK.